Frederik Samuel brought our attention to this piece (at left) for The Pink Line, in which we're actually staring through the receiver holes of a telephone, at the woman on the floor. "Help is close," the ad coaxes. We kind of liked the esophagus concept better. Abuse hotlines or help centers are always trying to magnify the moment you're left bleeding on the floor. Like children gone numb to the act itself, this repetitive stance is getting tiresome - and focusing on the traumatic moment may actually miss the point. Why can't they make like your standard ad and put the spotlight on the vast improvement that takes place after taking action? Granted, healing is less interesting than stained linoleum, but it's a stance that may stick out. Leo Burnett made this pretty little GreenPeace video for Japan, which is currently undergoing some drama having to do with whaling and such. Because whale meat was the main source of protein for the island after WWII, Japan feels it has the right to go on whaling, even if there's no demand for the meat (according to the Greenpeace pressie, considering we don't ourselves know how much or how little the island folk need whale meat today). So Greenpeace goes, okay, let's restructure this historical conversation and turn the notion of man-to-whale relationships into one of reciprocal respect, instead of a Giving Tree situation (we hated that book, by the way) - where one side keeps giving until there's just nothing left. Apparently having "unalienable rights" can mean more for the common cow than just avoiding aliens. The fine folk at Sustainable Table have launched a campaign called Cows Unite, in which our bovine buddies battle it out for organic sustainability. Check out the Bovine Bill of Rights, which states, among other things, that cows have the right to dignity and joy. Well, hey. Unlike the citizens of most countries, they clearly know what to ask for. No wonder the aliens are always abducting them. We wonder what cows themselves would actually have to say about how much personality we project onto them. Would they laugh? Would they demand royalties in grassy knolls? Would they become self-conscious about their spots? What a Way to Deliver a Message. We're really impressed by the gravity of this outdoor piece, part of the War Orphans campaign developed by Kolle Rebbe, Hamburg for Misereor, a German Catholic charity. According to AdCritic the campaign won a Black Pencil in the Illustration: Press Advertising category at the 2007 D&AD Global Awards. 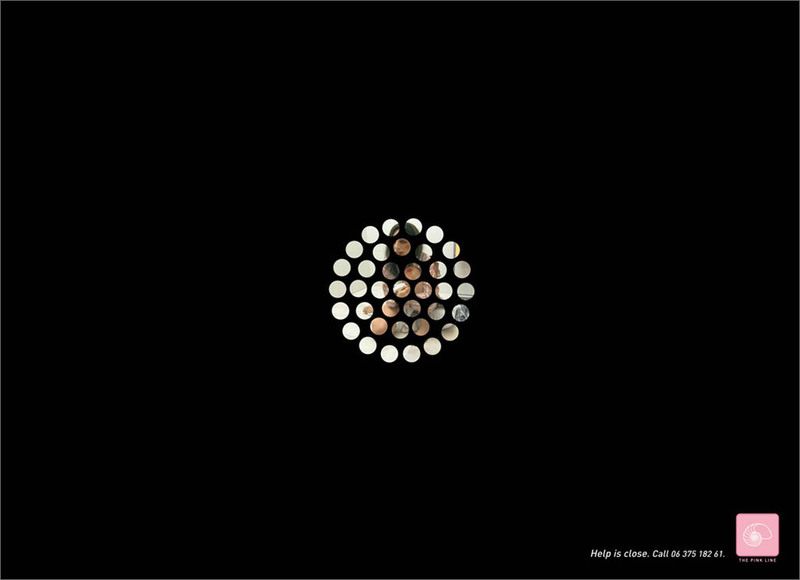 Only two Black Pencils can be won per year, and it's rare that an Illustration entry makes the cut. 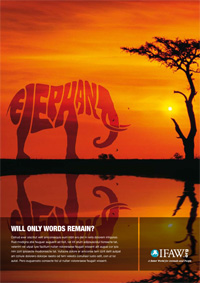 D&AD President Tony Davidson explained that "the simple idea behind [...] 'War Orphans' made the jury's decision easy. 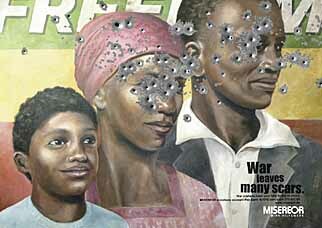 Naive family wall paintings they may be, but seeing where shells of bullets have shattered the images is a great and easily understood metaphor." Laments about typography aside, a low-key but powerful image like this one can both transcend and sober most tongues. Way to be a buzzkill, guys. Just kidding. Developed for the World Wildlife Fund, its water levels rise when the sun hits it. 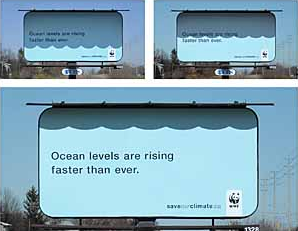 Text reads, "Ocean levels are rising faster than ever." John St. has just launched a campaign for Rethink Breast Cancer. 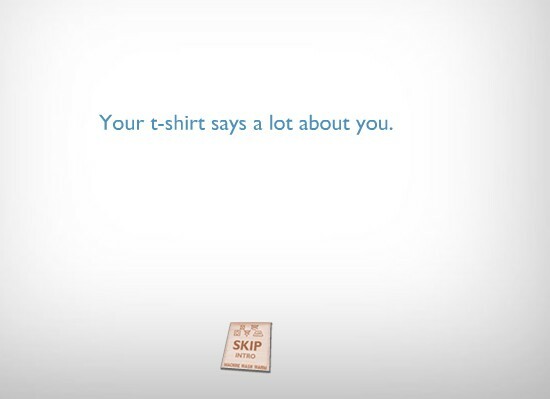 The idea is to get you thinking about assumptions you make about shirts people wear and ultimately convince you it would be awesome to buy a breast cancer tee. Radio spots by shirt type: Camouflage, Chinese symbol, Bride. The ads do a decent job of helping you jump the proper cognitive hoops but overall we felt chafed by the processed vanilla yogurt feel. Sitting through this felt like Homestar Runner's Marzipan come to life and singing us one of her insufferable folk songs. Toronto-based AdBands, a collection of rock bands made up of some of the advertising industries most talented creative people, are coming together on May 31st for a third year to raise funds and awareness for one little girl with autism. The 'Adbands' concept was conceived by Craig Brownrigg, Director at Radke and former agency Art Director and uncle to five year old Tennyson, who is affected with autism. The event aims to raise funds for Tennyson's costly IBI Autism therapy and the Geneva Center. It's a nice cause but we do have to question the use of the death-focused skull and crossbones logo on the organization's site when the cause is all about helping a person live.